Cherry Veneer Conference Tables! IN STOCK + Free Shipping! Create a first rate professional image in your conference room with the rich Dark Cherry veneer of the Franklin Traditional Conference Table. Now available at incredibly low Modern Office Special Offer prices. For a limited time buy a genuine wood table for less than a lower quality laminate table! 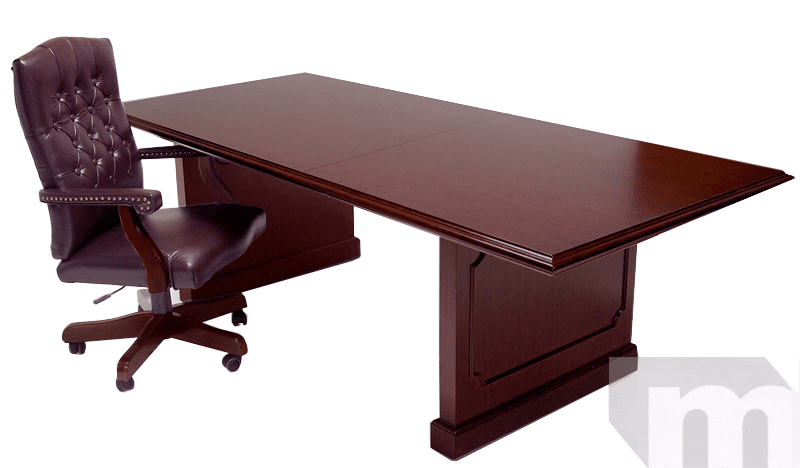 10' Conference Table includes two bases, two tops and single stretcher support. Measures 120"L x 47-1/2"D x 30"H. Shipping weight 284 lbs. PRICE INCLUDES SHIPPING! (Truck shipment - see Terms & Conditions). IN STOCK! You will certainly be impressed with the beauty of this real wood table. The satin smooth finish has a thin polyurethane coating for an extremely durable finish for a real wood conference table. You will surely feel the difference between this and lesser quality conference tables by its substantial feel. The tops are a full 1-3/4" thick and legs are 2-1/2" thick! A vertical cross brace mounts between both legs for additional support. * All pieces in genuine wood veneer and solids only - no laminates. * Table tops are heavy 1-3/4" thick for solid, substantial feel. * Solid wood mouldings and detailed edges on all pieces. * Polyurethane topcoat helps protect against scratches and discoloration. * Sturdy 2-1/2" thick (4" thick at base) legs for stability. * Adjustable levelers for uneven floors.